The horseshoe crab is a direct throwback to the day before dinosaurs roamed the earth, yet they’re a common occurrence on the beach. Scientists have traced the horseshoe crab back to the Paleozoic Era (when visible life first appeared), which means this popular creature actually provides the world with information about the entire planet’s climate, geology, flora and fauna from more than 540 million years ago all the way up to the present. That means whatever killed off the dinosaurs and all sorts of other creatures was unable to kill the horseshoe crab. Every horseshoe crab found on the beach is an adult. They’re large and shaped a lot like helmets with a spiny tail attached. But that’s not how they begin. Horseshoe crabs start off as eggs and within two weeks they hatch. As they continue to grow, they molt, or, in other words, shed their shell. Sometimes these molted shells can be found on the beach, especially in the tidal flats areas, which is where the crabs live for their first two years of life. To protect themselves after shedding their shells, the horseshoe crabs burrow into the sand in the tidal flats to avoid natural predators. The crabs molt several times in the first three to four years of life and then once a year or so until they reach adulthood. Once horseshoe crabs reach adulthood, they no longer molt. Spawning season for horseshoe crabs varies as it depends on latitude, but the peak spawning season generally occurs around May or June, especially during evening high tides and full and new moons. That is when the females, which are full of eggs, move out of the water and up the shore to spawn. They give off pheromones that attract the many awaiting male horseshoe crabs. The males, which are smaller than the females and possess an appendage for spawning, clasp onto the back of the female to fertilize her clutch of eggs. Generally, one female horseshoe crab is surrounded by up to five or six male crabs. Each season, the female crabs lay about 80,000 eggs. But perhaps the most interesting thing about horseshoe crabs isnt how long they’ve been around or what they do in their own lives, but what they do for humans. 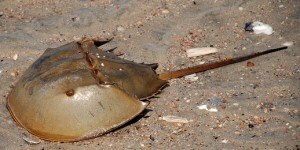 An extract of blood from horseshoe crabs is used by pharmaceutical and medical device industries to guarantee that their products (which include vaccines and intravenous drugs) are free of bacterial contamination. The use of horseshoe crabs for this practice was discovered by Dr. Frederik Bang in the 1960s while he was working at the Marine Biological Laboratory in Massachusetts. It was there that he discovered that marine bacteria when injected into the bloodstream of a North American horseshoe crab, massive clotting occurred. This was discovered to be a result of an endotoxin, which is a component of the marine bacteria used by Bang. The horseshoe crabs used for this process are in two ways. In shallow water, they are hand-caught using a clam rake; in deep water, a dredge is used. The crabs are then transported by truck to a laboratory where 30 percent of their blood is removed. Afterwards, they are returned to the water and their blood volume returns to full capacity within a week. While many people are against the testing of animals for medicinal purposes, the mortality rate for horseshoe crabs that are bled is anywhere from 3-15 percent. The majority of crabs can actually be bled once a year the same as humans and suffer no ill effects. Seeing as the horseshoe crab is a vital part of the ecosystem, conservation is key to their survival. Currently, records indicate that there are at least 4.5 million horseshoe crabs on the Atlantic Coast, but other studies suggest the number is higher. However, some studies show the spawning is down on many beaches in the same area. The biggest threats to horseshoe crabs include beach strandings, disease, and natural predators. Beach strandings are responsible for about 10 percent of adult horseshoe crab deaths. Death from strandings occurs when the crabs suffer from too much exposure to heat and oxygen or from seagulls, which eat the overturned crabs. Overturned crabs on the beach that are still alive can be helped just by being flipped over. It is best to flip the crab by gripping the edge of its shell and turning it over. The tail is delicate and can be damaged easily, so do not flip over a crab using its tail. Horseshoe crabs do not bite or pinch, so it is safe to turn them over. Knowing all of this, the next time you’re on Edisto Beach take a look around and see if you can spot a horseshoe crab.